This 100-acre (40-hectare) nature preserve is located on Mt. Tzouhalem in the Cowichan Valley, and includes dramatic cliffs that offer spectacular panoramic views of Cowichan Bay and the valley beyond. Chase Woods represents an ecologically and culturally significant piece of the Cowichan Valley mosaic. Rising from sea level to almost 400 metres at the summit of Mt. Tzouhalem, Chase Woods nurtures a microcosm of the rare coastal Douglas-fir forest in all its diversity. Connected to the Mount Tzuhalem Ecological Reserve via the forested slopes of Providence Farm, and containing the cross that can be seen from across Cowichan Bay, Chase Woods supports a natural treasure that is already well-loved by naturalists, hikers, historians and countless others from the local community and beyond. A popular network of trails criss-cross Mt. Tzouhalem, passing through municipal forest land, Chase Woods, the provincial Mount Tzuhalem Ecological Reserve and Providence Farm. A defining feature of the mountain is a giant cross that stands on the cliffs of Chase Woods. The white cross can be seen across the valley, and is a beloved local landmark. Thousands of people each year hike the trails on the Mount Tzuhalem Ecological Reserve that lead up to Chase Woods and the cross. 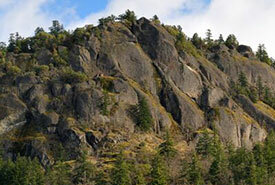 The challenging trek rewards hikers with a panoramic view of Cowichan Bay and the valley beyond. Hikers and mountain bikers alike use these trails, so please use caution and be aware of your surroundings when visiting these trails. Thanks to Heavy J’s Official Mt. Tzouhalem Website for sharing these maps with NCC. Visitors to NCC's conservation lands do so at their own risk. Hike and explore safely! David and Louise Chase came to the Cowichan Valley in the 1950s intending to log a property they had purchased sight unseen. But upon setting foot in the grand Douglas-fir forest, their priorities changed. The Chases settled on the property and spent five decades carefully tending their beloved forest and sharing their private park with friends. 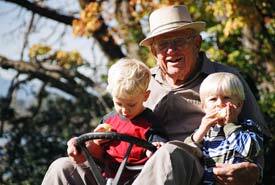 After Louise passed away, David cared for the property until, at age 98, he began looking for a new land steward. 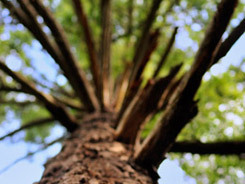 NCC acquired Chase Woods in 2009, fulfilling David's dream of protecting the towering trees forever. Habitat: Older coastal Douglas-fir forests are among the rarest ecosystems in British Columbia and are considered of the highest conservation value. Chase Woods supports 100 acres (40 hectares) of intact coastal Douglas-fir habitat, nurturing centuries-old western yew, Douglas-fir, Garry oak, lodgepole pine and arbutus. The property is home to a number of rare species and habitat types, including the globally imperiled Garry oak plant community. Dramatic boulder fields, hidden caves and steep cliffs create structural diversity and support a multitude of small mammals, bats and birds of prey, including the COSEWIC-listed peregrine falcon. Water: Verdant streamside habitat supports numerous amphibian species. Wetland areas connect to tidal channels of the Cowichan estuary, which are important to salmon and waterfowl. The wetland also attracts large breeding congregations of Pacific tree frogs, great blue herons and raccoons. 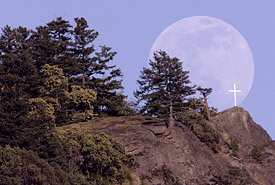 Connectivity: Chase Woods connects to the Cowichan Bay estuary, much of which is already protected by other conservation organizations. The adjacent undeveloped slopes of Providence Farm allow rare species to move between the Mount Tzuhalem Ecological Reserve and Chase Woods. Nearby, the Cowichan Garry Oak Preserve (the Nature Conservancy of Canada's flagship project in the valley) harbours many valuable and rare species that will benefit from increased habitat in the general area. Mt. Tzouhalem carries great cultural significance for the people of the Cowichan Valley. The mountain takes its name from a 19th century First Nations chief who had a reputation as a violent, temperamental warrior. Stories tell of Chief Tzouhalem retreating to the caves on the mountain with his many wives, only to toss them to their deaths from the clifftops when he tired of them. Cowichan Tribe members continue to use areas on the mountain, including on Chase Woods, for special ceremonies and spiritual practices. We would like to thank the following groups for their support in the campaign to protect Chase Woods: Cowichan Community Land Trust, Kaatza Foundation, Lohn Foundation, Federal Government (through the Natural Areas Conservation Program), BC Trust for Public Lands, TD Friends of the Environment Foundation, British Columbia Conservation Foundation, Maple Bay Ratepayers Association, Laura Harris (in memorium), Sue Coleman and numerous Cowichan Valley community members.